If skiing is in your blood, every season is ski season. So, if you’ve thought about heading to South America for a summer ski adventure, then Portillo, Chile is the place for you. High in the Andes Mountains, with gorgeous sun- ny days and uncrowded powdery slopes, it’s a skier’s paradise. But what makes it so special is something else entirely. It’s like stepping back in time to an era of old world charm where the resort experience has been treasured and pre- served by the Purcell family for over 50 years. 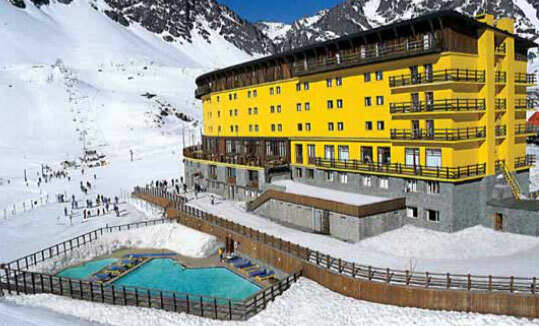 Portillo is an all inclusive, self-contained resort, like a cruise ship in the mountains. Visitors come for an entire week, make new friends, reunite with old ones and return year after year. Even as a new guest everyone says hello to you, and a camaraderie develops; partly because you will be seeing each other all week, but mostly because the Purcell’s have created a wonderful environment of relaxed comfort and friendliness. There is one big yellow hotel with roughly 400 guests attended to by 450 employees, an impressive ratio of better than 1 to 1. There is no town, no shopping centers and no Starbucks, just a carefree vacation. There are 4 (yes, 4) meals served each day in a classic dining room, presided over by maitre d’ Juan. Chef Rafael Figueroa prepares wonderful meals using locally grown products, paired with fine Chilean wines. Waiters know your name by the second day and might even have your favorites waiting for you as you arrive. Eat as much or as little as you like but be sure to leave room for the homemade desserts. But let’s face it, you come to Portillo for the skiing, and it’s incredible. There’s deep, light powdery snow on bowls, chutes and groom- ers as far as the eye can see, along with bright sunshine and deep blue skies. The hotel is slopeside, so access is a snap. Just head down to the ski room, have your boots handed to you by someone who somehow knows they are yours, pick up your skis and away you go. No cars and no hassle, just fun. The slopes are uncrowded and await skiers of all abilities. Lessons are available from trained instructors, which might help you prepare for the “Sol de Portillo” guest race run every Thursday. Don’t miss lunch at least one day at “Tio Bob’s,” the mid mountain gem, where you can eat a delicious lunch, sip local wine and marvel at the spectacular panoramic views. Of course resort amenities such as a fitness room with daily yoga classes, outdoor pools and hot tubs with amazing views, wine tastings, a very cool bar and free wi-fi to keep in touch, if you must, are all available. Families love coming back to Portillo year after year. There are special family weeks and pricing, with lots to do; kids camp, ski school, a cine- ma, game room, climbing walls, kids ski races and even day care and babysitting. Portillo ski season runs from the end of June to October 1st. Lan Airlines flies non-stop to Santiago, Chile from New York and other U.S. cities. From there it is a scenic 2-hour drive to the resort. My suggestion is to spend a few days in Santiago, a beautiful city full of life and cul- ture. The resort can arrange transfers and sight- seeing in Santiago as well as winery tours.